Many people started emailing me asking when they should start booking their Umrah in Ramadan 2019 in order to get good prices. The very simple answer is now! Usually, if you are booking your Umrah on cash you want to start planning and keeping an eye on prices and this website about 7-8 months in advance. The reason? Majority of people don’t look this early! So, you will be getting a much better deal than someone who starts to look 6 months or even a month before Ramadan 2019 when the prices will be high. Now, this post is about Do It Yourself Umrah in Ramadan 2019 on a budget so we will look at all the budget hotels which are new but a little further away. Current prices for hotels close to the Haram like the Hilton Makkah or the Marriot, Fairmont etc, they retail for about £ 600 per night. For this price, I will show you how you can a whole Umrah per person. I am always super excited about the new hotels because although many of them are further away from Haram and require a walk or a shuttle, they offer a much better deal for people who are doing Umrah on a budget. I usually get some comments about the hotels I write about and the cost especially for those who don’t use loyalty programs. Without further ado let’s have a look at what you can get if you start booking your Umra for the last 10 nights of Ramadan 2019 now. One of the most frequently asked questions is about the Umrah visa without a package. Currently, this option is available and many agents in the West offer this. Some will try to discourage you because they don’t want that since they are not making much money, but it’s possible. Only Umrah visas in the UK you can get from Prince Visa which I have recommended before. 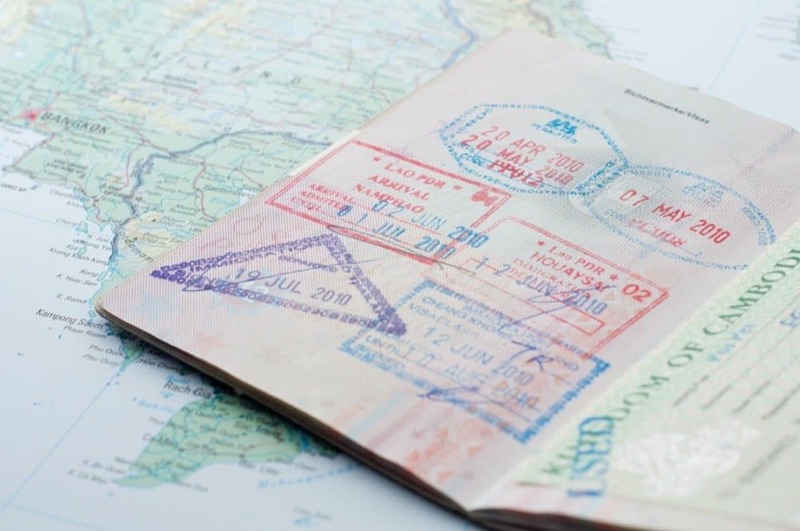 We don’t make a commission but they do offer our readers a 20% discount and their visas cost approximately £80. If you want to support MuslimTravelGirl and you find this information useful, then please consider booking with our affiliate links. You don’t pay extra but we do make a very tiny percentage. Please note that the Saudi government changed the rules of Umrah visas again this season. If you have been for Umrah in the past 3 years you will have to pay the extra 2,000SAR per person. For more information and to check your passport details in the Hajj Ministry site click here. If you have read my other blog posts on Umrah you know I am a fan of open jaw tickets. An open jaw ticket is where you arrive in one airport and then you leave from another. In this case for me the perfect Do-It-Yourself (DIY) Umrah is to arrive in Medinah airport which is smaller airport so the immigration process is faster and after travelling for so long especially with children you can get out and be closer to the city. Usually, open jaw tickets can be a little cheaper or a little more expensive but considering that you will have to actually travel for 5 hours in each direction to get to Jeddah from Medinah I think it might be worth the extra money. There is nothing better than arriving at the airport and not having to drive for 2 hours to Makkah, at least for me. 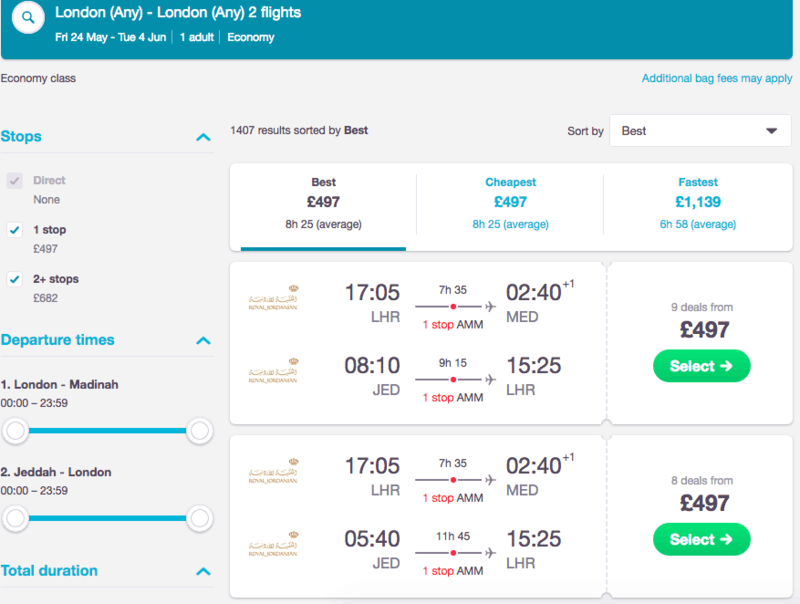 Currently, the cheapest price for an open jaw ticket from London to Medinah and Jeddah to London is £497 with Royal Jordanian. Last year for our Umrah we flew with them and I had no issue. To check the prices or any other availability go to Skyscanner here. 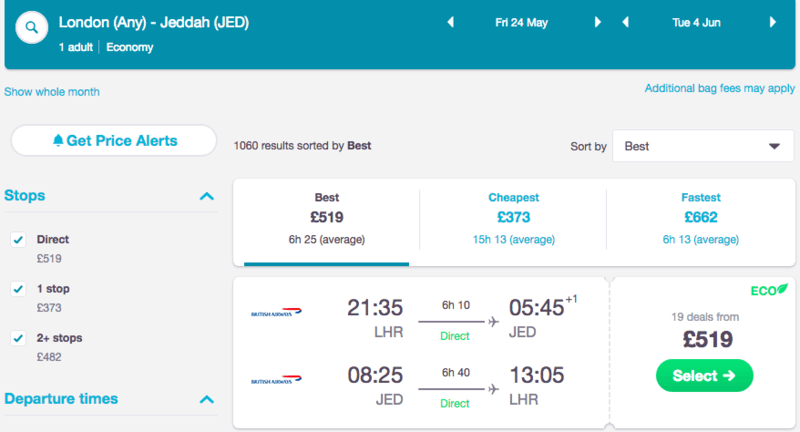 Currently, the best price you can find for flights from London to Jeddah direct with British Airways costs around £520 return which is a great price. 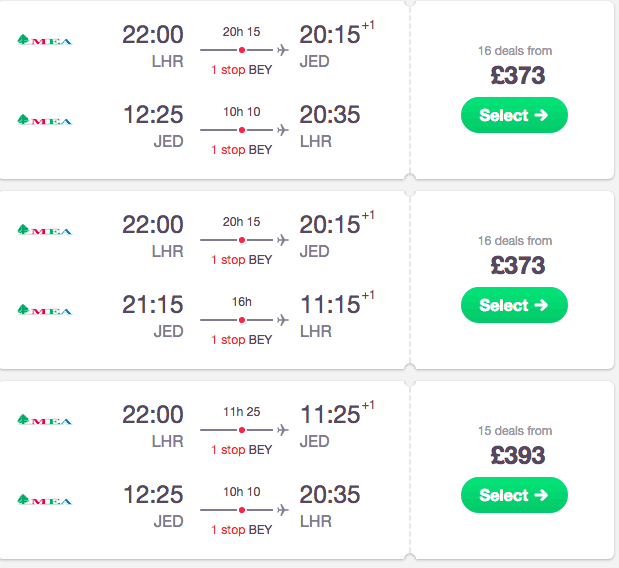 The cheapest flights currently with Middle East Airline via Beirut come to about £320 return. The layover is longer however so it might not be suitable for small kids. A shorter layover in Beirut is about £394. The airline is perfectly safe and it is the National carrier of Lebanon. If you want to search for direct flights or dates go to Skyscanner or click the link of the photo I can see the full month option. You can also change the cities since this is only an example. If you live in the USA or other countries you just need to book your flights from their airports and follow the rest of the advice. Hotels in Makkah especially around the Haram can be very expensive in the last 10 nights of Ramadan. This has to do with availability, demand and of course space. There is only so much space available around the Haram and actually, Mekkah has one of THE most expensive real estates in the world. 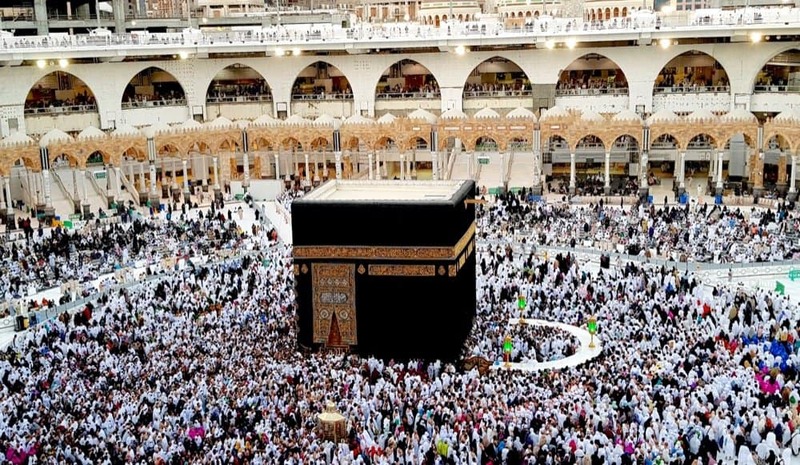 As this is an Umrah in the last 10 nights of Ramadan 2019 on a budget we will look at the new hotels and existing hotels with some of them further away from the Haram but that offer excellent deals! After all, when you are all day in the Haram you don’t need a hotel next door. You can manage the prayers, go for a rest in a nice new room and come back for more ibadah. All of this without breaking the bank or having to sell a kidney to afford. 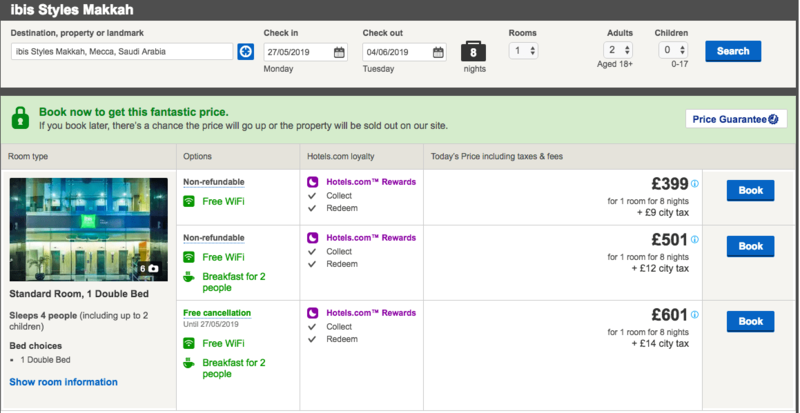 I am seriously impressed with all the new hotel brands coming up. Plus you can even find them on sale. Hotels normally have sales 3-4 times a year every 3-4 months. If you start counting from Christmas shopping they will offer sales around April time, then Summertime and then Autumn which is now and then of course back to Christmas. This is important to remember because you can get great savings. 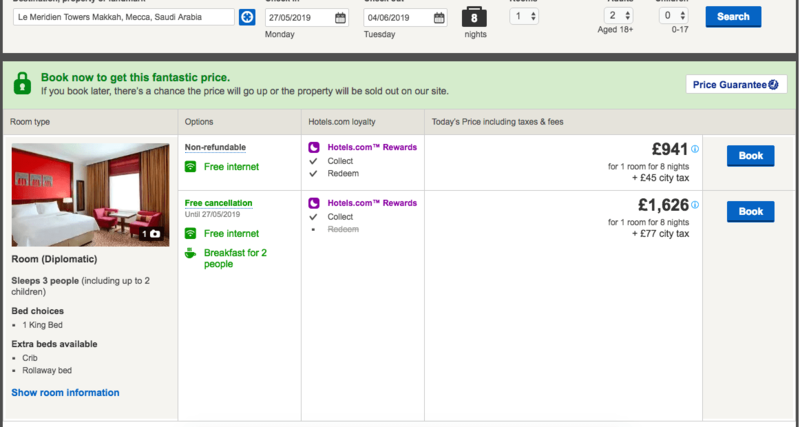 I book with Hotels.com because when booking a long trip like Umrah you get the 10th night free as a gift voucher to use later, so it’s a saving for you. You don’t get it straight away but rather it will be issued after your stay to use for another holiday. Below are the hotel options which I would pick personally for my family and friends, hence I also recommend for you as my extended family. The Le Meridien Towers Makkah is one of the older budget hotels in the area but for several years it offered a great service to those who want to be in Makkah during Ramadan. It is part of Marriott now, so you know it is a reputable brand if anything goes wrong. You will need a take a shuttle to the hotel and back but you can also walk it in about 15min. One of my students and readers visited the hotel during the last 10 nights a couple of years ago and he was happy. Considering the price it’s excellent value. There is, of course, a 24hr shuttle. Prices for 8 nights from 27th of May to 4th of June cost £940 for up to 3 people or two children! They also have the executive suite for £1,300 which is still a good value. You can read the Tripadvisor reviews here. This is a brand new hotel only a year old and it still offers one of the best value options for hotels in Makkah. Yes, it is a little further away and it is 3 star but it is Western standard Ibis, new and clean. This cannot be said for many of the hotels in Makkah. Still, if you are on a budget this hotel simply cannot be missed out on value! For two people for 8 nights it costs £433. If you have children or two more adults the price goes up to £550. You will need a shuttle for this hotel, but the reviews are good and for the price you pay and the time of the year it’s excellent value. You can read the TripAdvisor reviews here for the Ibis Makkah Hotel. For those who are price sensitive and don’t want to be too far out of the Haram, this hotel is one of the best in my opinion. 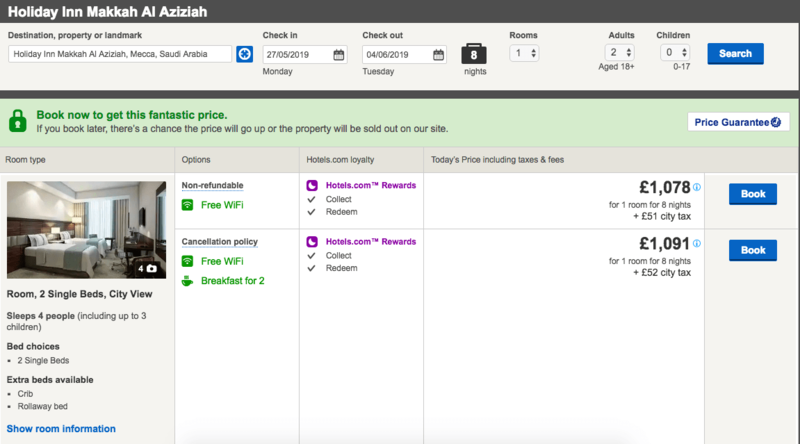 This Holiday Inn is a new hotel in Makkah or more like Aziziah. It is further away but still a good price for a brand new property. You will definitely need a shuttle to get there. I find that the price is a little steep for the location and also the fact this is a new hotel. Every new hotel comes with teething issues which do take time to iron. Dates: 27th of May to 4th of June 8 nights comes to £1,105 for up to 4 people. So if you have a family or small kids this is an excellent value for you. However, considering that it costs £1,000 for 8 nights when other closer properties to Haram cost £1,000 a night it’s still a good value. The property is new, clean and modern which is a big advantage as after a day or night in Haram you want a nice place to relax and shower. At least I do! Plus the breakfast is free for up to 2 people. Read the reviews on Tripadvisor for the hotel here. Usually, prices in Medinah are cheaper and I am pretty sure they will go down closer to the time. 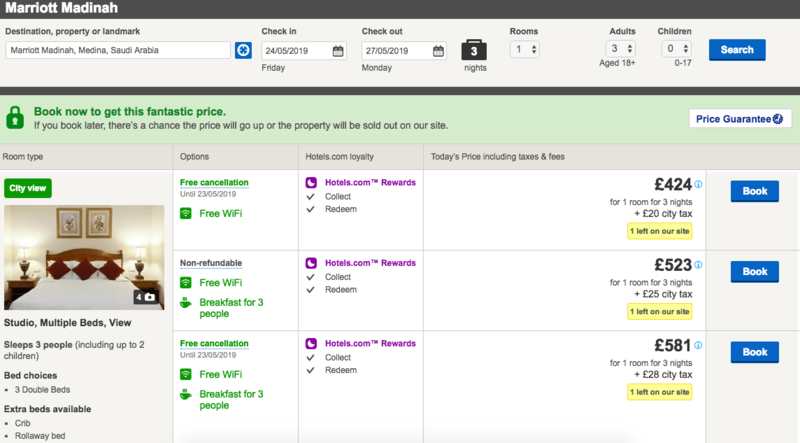 I have monitored Saudi hotels for years especially during Ramadan that it simply can’t be fully booked. Even a week before the last 10 nights you can find availability. Just because of the prices currently retailing I have only put 3 nights in Medinah as I don’t think they reflect the true value of the properties. Normally my top three properties will be Mariott hotel, the Crown Plaza hotel and the Pullman hotel. The Crown Plaza is a little further from the female entrance but there is a shuttle. It is also conveniently located next to the SAPTCO bus station which is great if you are using the coach. The Pullam hotel is newer and more central in location. The Marriott hotel is an older property but centrally located. The dates for this hotel are on the 24th of May to the 27th of May. The Marriott hotel for the last 10 nights of Ramadan 2019 for these three days comes to £397 for two people and £427 for a studio / 1 bedroom apartment for up to 4 adults or children. The Pullman hotel is a new hotel in Medinah, it has good reviews and it’s in close proximity. Currently, it is available on Amoma.com for three nights from the 24th of May to the 27th of May for £444 for two people with breakfast. I would wait and see if this will be available on other sites other than Amoma as I have heard they do overbook. Usually, in such cases, I just go and monitor Tripadvisor here, so it gives me all the options than searching sites individually. The Crown Plaza Medinah usually can be found for approximately £140 per night during Ramadan and availability is good. It is a new hotel which offers also a shuttle to the women’s entrance or you can walk there are about 15minutes. We have readers staying there every year and enjoying their stays. The convenience of the SAPTCO bus is also a bonus during Ramadan. Make sure you book your tickets in advance however for the coach to Makkah. To book or change up to date prices click here for the Crown Plaza Medinah. For reviews of the Crown Plaza Medinah hotel on Tripadvisor go here. I have a very big and comprehensive article on transportation during Umrah which covers everything you can do. Please read the full article for your Umrah transportation needs here. My favourite option is to get an Uber from Jeddah or Medinah airport to my hotel. For transportation between Medinah and Makkah, I was adviced by friends years ago not to use taxi drivers as especially during Ramadan they work so many hours that accidents happen too often. I prefer to use the SAPTCO VIP bus which is government owned and also they are cheap and reliable. Just make sure you book your tickets straight after your arrival as it is popular. They do have a standard coach but the VIP is a little more expensive and it offers more space, table and drinks. Also, they stop at the miqat so you can change in your ihram if you are travelling from Medinah to Makkah. Overall whichever option you pick for Umrah 2019 it will be cheaper and of a better standard than what it could be with an agent. I find that Umrah packages for 2019 in Ramadan for a three-star hotel are about £1000 for a triple room. With these, you will have a similar experience but it will be in newer hotels. 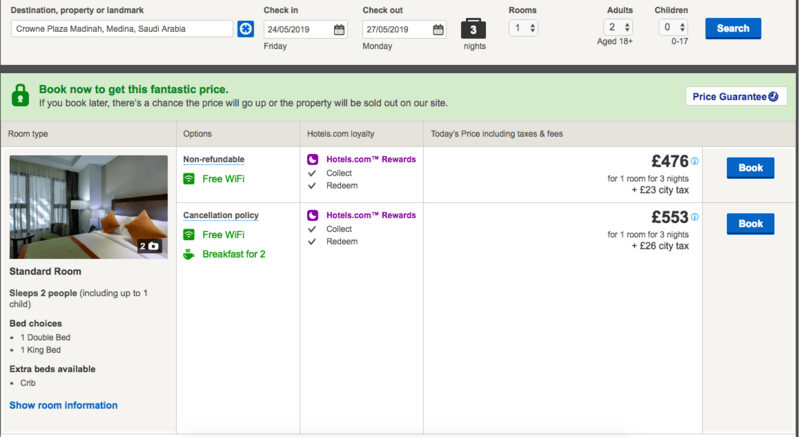 If you pick to just go to Makkah and spend the nights in the Ibis hotel this can be the last 10 nights of Ramadan for £800 per person for two weeks. This is a pretty sweet deal. Please use the option above and price it for your family. You will need your country to find the flights. The Royal Jordanian flight has just a 45 min stop over in Amman. Was this sufficient for you last year, or did you have a longer lay over? I think if there are no delays 45 min is OK, so if you are on one ticket and you miss the connection they will put you on the next one. Our flight connection was about 2 hrs I think last time. Me and my family would like to spend one day Eid after ramadan would be better in Medinah or Makkah? I have spent time in Makkah and I did enjoy it. There were so many people for Eid prayer so it’s definitely nice if you can stay there. Asalamualaikum sister, I’m planning to go with my husband and two daughters for umrah in ramadhan 2019 during halfterm which comes in last ashara alhamdulillah how much it will cost me , any idea??! Now it will be almost more expensive than the above mention in the post, probably you will be looking at 2 times the price. Best will be to actually click on the links and see the prices it offers it is the quickest way.